Sometimes you just want to see your favorite heroes pound each other to sand. One of the key things that separated the Marvel Universe from the DC Universe right through the ’70s: Marvel’s heroes punched first and asked questions later. It was a grand tradition harkening to the Golden Age of Comics when Marvel was Timely Comics and the Human Torch and the Sub-Mariner waged war over Manhattan in a series of thrilling duels. While over at DC, heroes might cross capes across a rooftop or during a bank heist or on a cruise ship (no, seriously, that is how Superman and Batman met back in “Superman” No. 76 in 1952) and shake hands and accept each other unconditionally as fellow champions in the Fraternity of Goodness and Justice, Marvel’s heroes were a twitch more paranoid. And for fans, it was a treat. One of the pleasures of being a reader is bickering with the nearest fan about whose hero could beat whom. Psychologists should have a term for this: Stuck at Eight. Could the Thing take the Hulk? Could the X-Men whip the Avengers? Could Hawkeye get out of a slap-fight with a third-grader? (Ehh, probably not.) Marvel was only too happy to oblige with all sorts of babyface wrestling bouts. And that brings us to “Amazing Spider-Man” No. 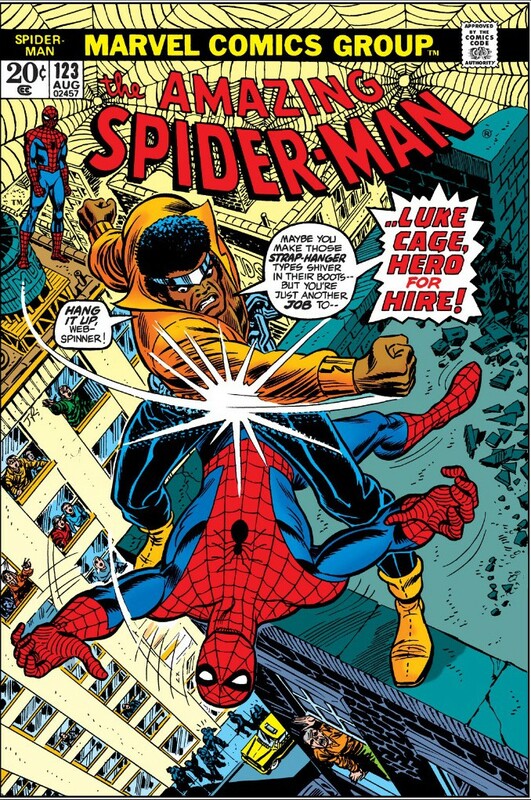 123, cover date August 1973, “…Just a Man Called Cage,” written by Gerry Conway and illustrated by Gil Kane and John Romita, in which our web-spinning wall-crawler goes toe-to-toe with Luke Cage, Hero for Hire. Spoiler alert: No table, no wall, no brick chimney is safe. This issue was actually a savvy change-of-pace in the ongoing, agonizing soap opera of Peter Parker’s life. In the landmark issues “Amazing Spider-Man” Nos. 121-122, the Green Goblin threw Peter’s beloved Gwen Stacy off the George Washington Bridge, killing her. Goblin, in turn, was impaled by his own glider. The impact of this grim story reverberated for decades. For many readers, this two-parter marks the end of the Silver Age of Comics. Your grief and mileage may vary. Funeral for a fallen friend. 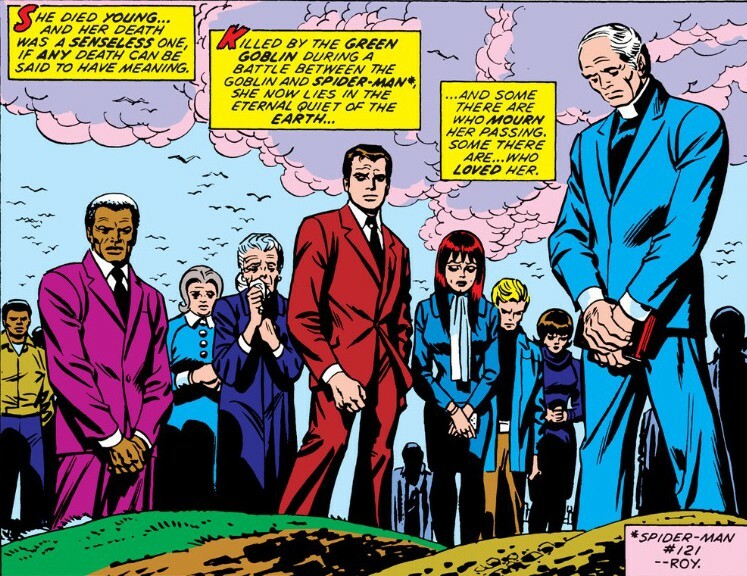 There’s a lot going on this follow-up – Gwen’s funeral brings out her friends and family, and just about everyone, including frenemy Flash Thompson, has a moment. It’s striking to read this 20-cent issue in light of how comics are scripted now. Today’s $3.99 issues offer a crumb of story meant to be assembled in a trade paperback collection. Here you get a full buffet, and it packs all kinds of punches. 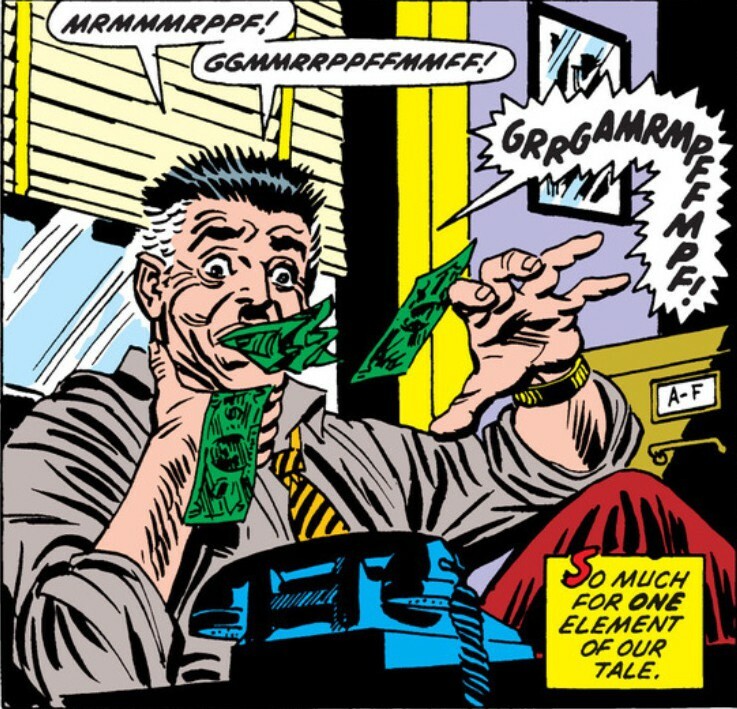 Daily Bugle publisher and professional crank J. Jonah Jameson believes, of course, that Spider-Man killed his buddy Norman Osborn and hires Luke Cage to bring in the miscreant – dead or alive! 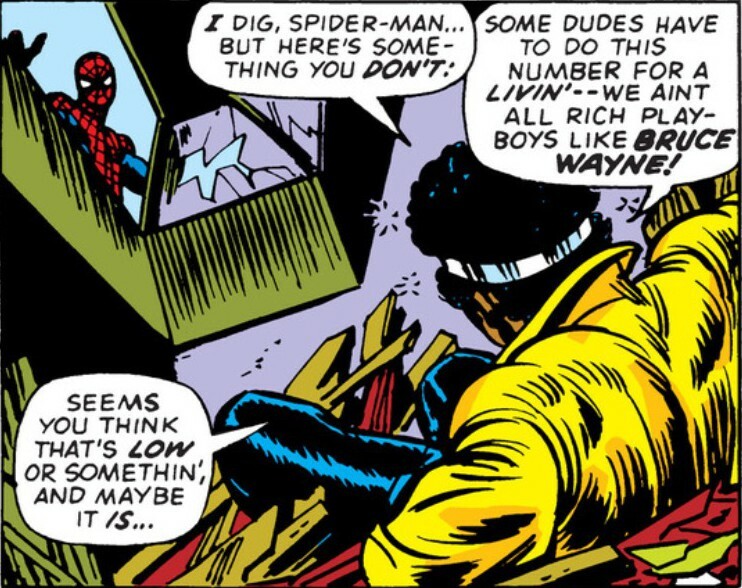 As a huge Luke Cage fan, I approve of any plan no matter how demented to bring him deeper into the Marvel Universe. Spider-Man collides with 300 pounds of muscle. 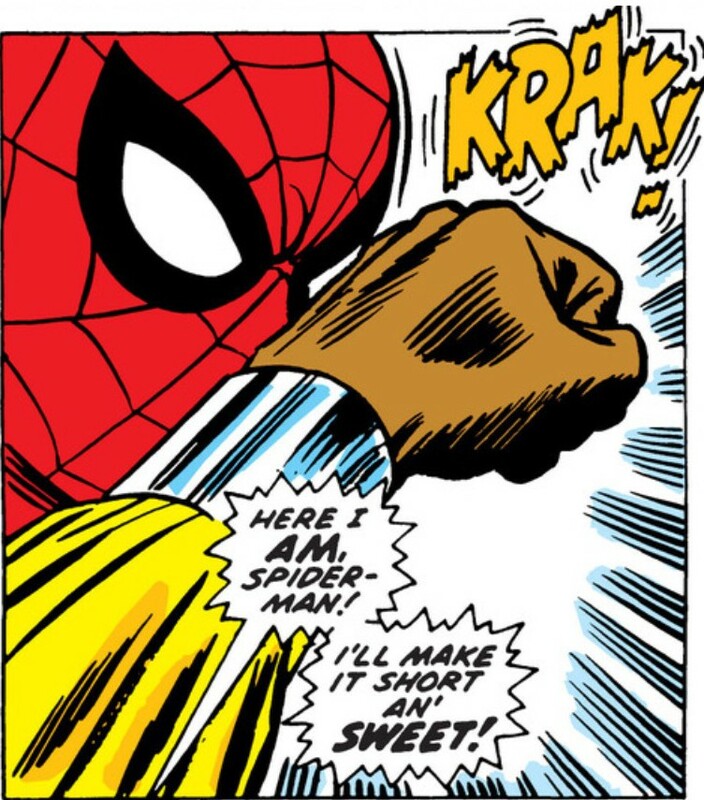 Spidey is so awash in grief and so ready to hang up his webs for good that his Spidey-sense fails to tingle with a warning that a 300-pound man of pure muscle is about to deck him. How often does that happen? 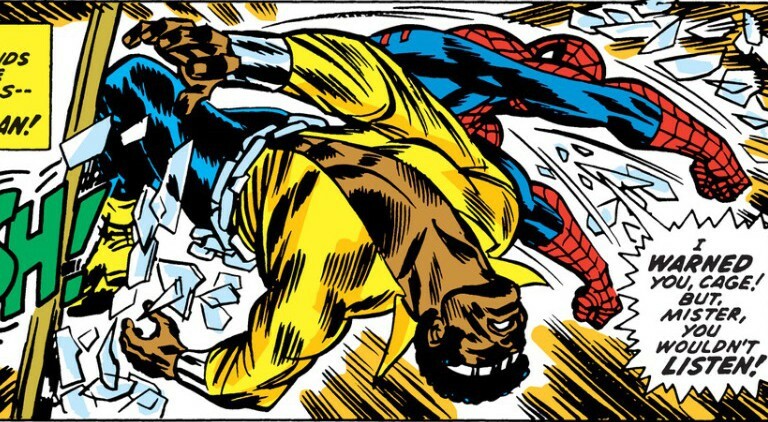 No property is safe when Spidey and Luke Cage tussle. The two trade blows and destroy just about everything in a ten-mile radius (so it seems). The Kane-Romita artwork shows us mass destruction and mutual annihilation in close combat. It’s glorious. Look at how the bodies fly. It’s the ballet of brutes, Marvel style. At the rate Luke is flying across the page, he better get some travel insurance. There is one What-The-Bleep aside for readers. Spider-Man blasts Cage for being a mercenary, and Cage defends himself by saying not every hero can be Bruce Wayne. 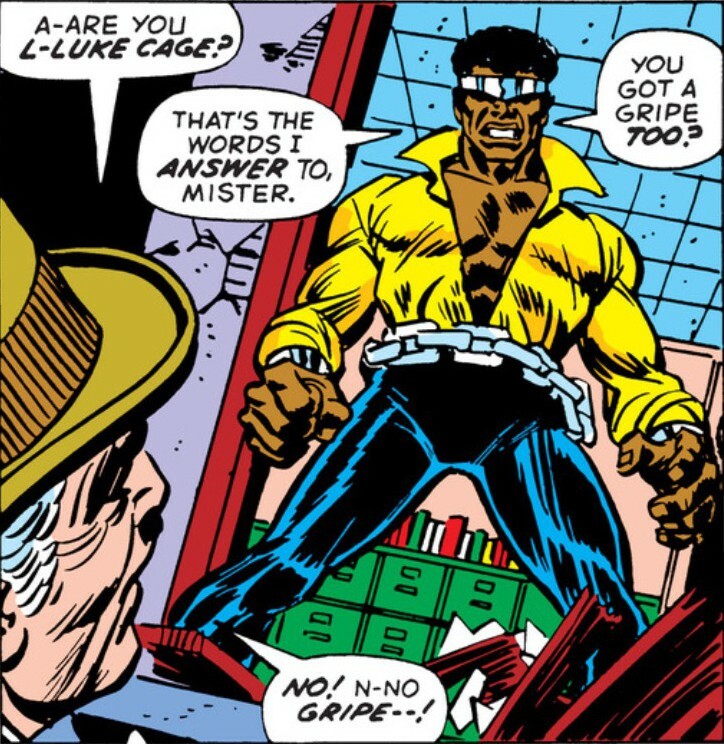 Seems Luke Cage is a fan of DC Comics. The crack suggests that either DC’s heroes exist as comic book characters in the Marvel Universe or that Bruce has been unmasked in the Marvel universe. Your call. Either way, it’s a rare shout-out to DC Comics that almost steals the scene. It also inexplicably enrages Cage to be called a mercenary, when that’s just what he is here. 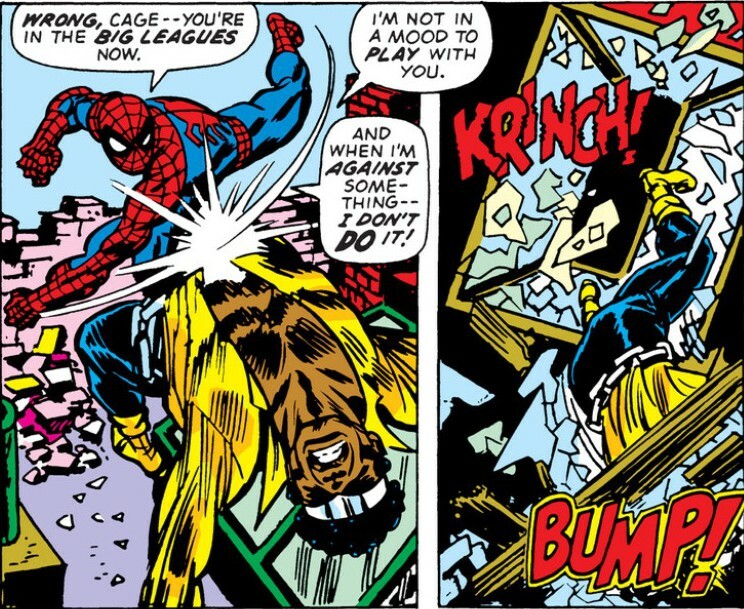 One more brawl later, Spidey uses his head and spins some webs to ensnare Cage and force him to listen to some hard truths about Jameson. We don’t hear those truths – but we do see the result – Jameson choking on the money he paid Cage. And that’s how you spin an entertaining story with two Marvel titans – all for two thin dimes. I feel sorry for kids today, or for that matter any kid who bought comics after the mid 70s. The age of whimsy is gone replaced by irony and cynicism. Keith, I try to be objective and wonder what comics might appeal to me if I were a kid today – the list is pretty darn short.